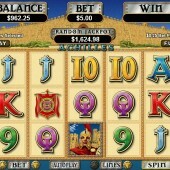 A slot from RealTime Gaming that I keep recommending to other players is Achilles. 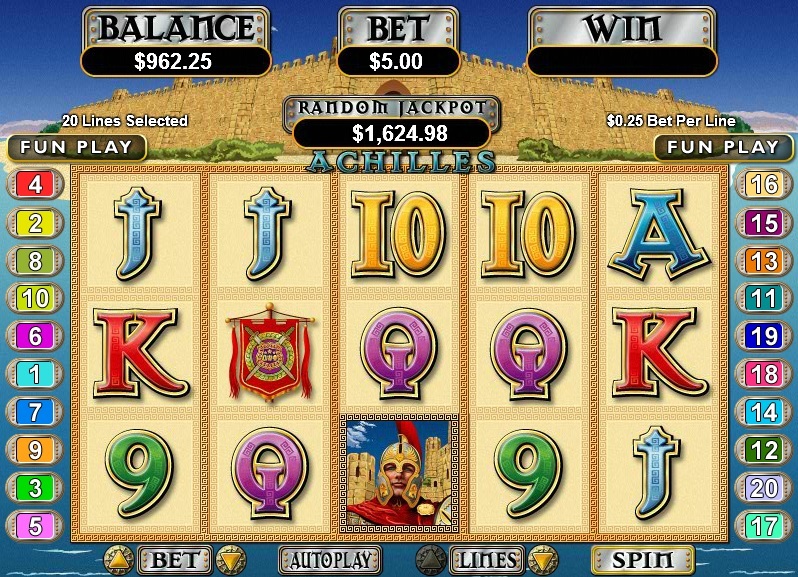 Based on the Greek hero of the Trojan war, the Achilles slot features plenty of symbols from this period in Greek mythology. If you love your Greek mythology slots then brace yourself! The look of the game has a feel of IGT’s Greek mythology-themed Treasures of Troy, but the game play's very differently. This 20 payline slot game has two bonus rounds, one of which can be very rewarding as I will explain later in this review. Strangely, the two bonus features are very similar in the fact they both offer free spins but you must attempt to earn the free spins in two separate ways. This confused me but you can never groan about two different free spin bonus rounds. The first of the two bonuses is triggered by three of more Wall of Troy Scatters. This will reward you with 10 free spins at 2x multiplier. Ok, so you might think that that is not much but I am always a big fan of free spins bonus rounds no matter how many free spins you are awarded. It only takes one free spin to pay out big. Not an overly exciting bonus, but this is not the only one found in the Achilles slot. The second bonus round is activated by three or more Achilles Scatter symbols anywhere on screen. You then pick one of the symbols to reveal your free spins – 10, 15 or 20, with all wins multiplied by 3. The added benefit in this bonus is that the Scatter symbol acts like a wild in the free spins. This bonus round is definitely the more rewarding of the two available in this game. I really enjoy Achilles mainly for its simplicity and the rewarding nature of the bonus rounds. This is a common theme in RTG slots, which are much simpler in look and feel to slots like Microgaming’s epic The Dark Knight or IGT’s prolific Elvis The King.